This convenient carrying case from Blackhawk contains space for a Mini Maglite or other similar-sized AA flashlight. It is made from tough, abrasion-resistant Cordura nylon. Its multi-layer laminate construction includes flexible polymer reinforcement for increased strength, as well as a layer of waterproof closed cell foam for weather and impact protection. The soft knit lining protects your light's finish. The top flap folds over to provide total coverage and protect the contents from all angles. 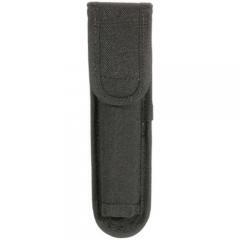 The case attaches to a belt using a molded belt loop that fits belts up to 2.25 inches wide.